There have been several fatalities associated with Pemex pipeline explosions in recent years, sometimes resulting from illegal attempts to tap into the lines. They include the disastrous blast in San Martin Texmelucan, Puebla, in December 2010 that killed 28 people. It therefore comes as something of a surprise to find press reports highlighting areas where people continue to live in vulnerable locations exposed to unacceptably high risks. In this post, we look at three examples, from the states of Oaxaca, Veracruz and Hidalgo respectively. According to a report by Martha Izquierdo in Mexico City daily Reforma, more than 300 families in the industrial port of Salina Cruz (Oaxaca) live in homes sitting atop Pemex pipelines. Previous municipal administrations are alleged to have issued permits for their construction, in total disregard for the potential dangers involved. The current municipal and state authorities have no plans to relocate these families, despite the daily risk they face. The pipelines carry oil into Pemex’s Salina Cruz refinery. The areas at risk are in the Deportiva, Hugo Mayoral, San Pablo Norte and San Pablo Sur districts (colonias) of Salina Cruz. Besides the homes, there are also vehicle repair shops, restaurants and even a shopping center in the zone along the pipelines. In Coatzacoalcos, Veracruz, near another Pemex refinery called Pajaritos, a small town called Mundo Nuevo has sprung up to house construction and refinery workers. Its 20,000 residents live in close proximity to no fewer than 26 pipelines entering and leaving the refinery and, according to this report from Jesús Lastra Ríos, they are not even certain of what materials are being carried in the pipelines, let alone their toxicity, flammability and explosiveness. In this case, apparently, the state “risk atlas” includes details of the pipeline diameters, but not their contents. Clearly, settlements of any kind should not be allowed so close to Pemex pipelines, but there are many similar instances in Veracruz, as there are in many other states. 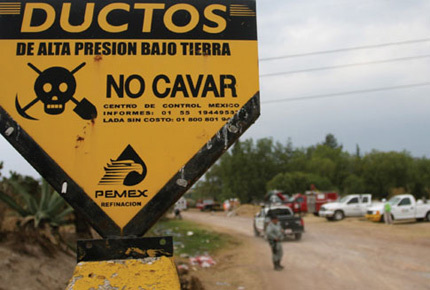 In Hidalgo state recently, the Education Ministry identified three schools as having been built “in high-risk areas near Pemex pipelines”. The state is making emergency plans to relocate the schools at an estimated cost of around $5 million. The schools are in the municipalities of Villa de Tezontepec, Ajacuba and Tlaxcoapan. The Hidalgo state government has a “risk atlas” covering landslide and other risks, but, apparently, most existing maps are based mainly on events that have already occurred. These three examples serve to illustrate the seriousness of the situation in many parts of Mexico where planning restrictions have not been effectively enforced, and where risk assessments permitting accurate mapping of the most vulnerable areas have still not been completed and are therefore not available to municipal or state authorities. Natural hazards in Mexico are discussed in detail in chapters 2, 4 and 7 of Geo-Mexico: the geography and dynamics of modern Mexico.